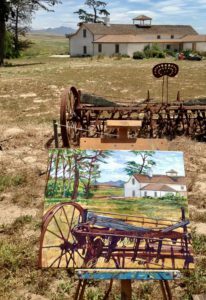 ART SHOWN: Larry Kappen’s “Dana Adobe,” acrylic. Join San Luis Outdoor Painters for the Environment at the Dana Adobe NatureFest, on Sunday, MAY 21 from 12-4pm! Watch how S.L.O.P.E. Members paint treasured spaces in a historical setting. Also be sure to enjoy the new Member Landscape Exhibit that celebrates Central Coast’s beauty & preserved areas now until September 8! The San Luis Outdoor Painters for the Environment (S.L.O.P.E.) 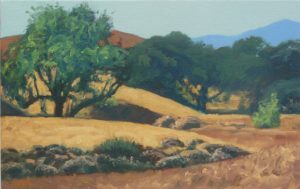 are celebrated painters who create artwork depicting the beauty and uniqueness of California’s Central Coast. They use their art to help protect and conserve local lands for open space, wildlife, and ecologically respectful recreation, ranching and farming. Watch the magic happen at the Dana Adobe: Nature Walks, Animal Guests, Kids Activities, a Scavenger Hunt, Making Adobe Bricks, Nature Talks, Learn about Solar Cooking, Feeding Birds, Wild & Exotic Animals + Honey & Bees. Heavenly Hot Dogs & Hawaiian Shaved Ice will be available for purchase, too, if you want a snack. Join us on Sun/May 21, 12-4pm at 671 S Oakglen, Nipomo, CA 93444 for an afternoon of family fun at the Dana Adobe!